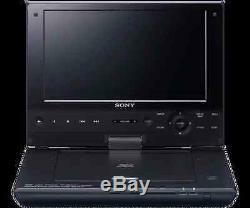 9 Portable Bluray Disc Player. Add a little excitement to your next trip with this portable Blu-ray Disc player. Keep the kids entertained with their favorite movies and musicwhether on Blu-ray Disc, DVD or CDand get up to 4.5 hours of viewing time on one charge. That's enough for two full-length movies. Flip-screen LCD delivers Full HD 1080p picture quality and swivels 180° so you can view your movies from the most comfortable angle. It's the perfect answer to are we there yet? Experience stunning picture quality in Full HD 1080p when watching Blu-ray Disc movies. Upscale the visual quality of your DVDs for crisper, clearer movies on the 9 diag. It's small enough to take anywhere, and the perfect solution to combat boredom on your next road trip or plane ride. The LCD screen swivels a full 180° so you can adjust it for the most comfortable viewing angleeven in tight spaces in planes, trains and automobiles. You can even push the screen flat against the body of the player to watch as you would on a tablet. When "I Spy" and the license plate game have lost their allure, this Blu-ray Disc player picks up the slack to keep everyone entertained. Get up to 4.5 hours of viewing time off of one chargeenough to enjoy two full-length movies. Or switch to battery power to keep the good times rolling right along. Dolby® Digital plus Decoding : Yes. LPCM : Yes 2ch (192kHz/96kHz/48kHz) out (on HDMI). HDMI Dolby® TrueHD Bitstream Out : Yes. HDMI Audio Out/ DTS Neo:6 : Yes. HDMI LPCM 2ch (192kHz/96kHz/48kHz) Out : Yes. HDMI Dolby® Digital Plus Bitstream Out : Yes. DTS HD Master Audio bit-stream out : Yes. Audio Features HDMI Audio Out. Bit Rate Indicator : Yes (Video/Audio). Multiple Language Display : English (US)/French(CA)/Spanish(Latin). Auto Power Off (Auto Stand-by) : Yes. XMB (Xross Media Bar) : Yes. TV System Default Setting : 60Hz. HDMI® Connection Output(s) : 1. Photo Slide Show with Music. DVD-R Dual Layer : Yes (+VR). DVD Camcorder 8cm DVD : Yes. Bonus View (Profile1.1) : Yes. SA-CD (SA-CD/CD) : Yes (CD part only). CD-R/-RW Multi Session : Yes(1st session only). BD/DVD : Yes (select in set-up menu). AVCHD Disc Format Folder : BD/DVD/CD/USB. DVD Video Output - HDMI : Via HDMI (480i/480p/720p/1080i/1080p 60Hz). 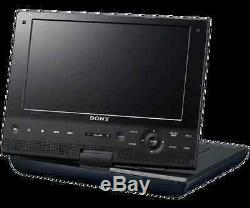 BD-ROM Output - HDMI : Via HDMI (480i/480p/720p/1080i/1080p 60Hz). DVD Upscaling : Via HDMI (480p/720p/1080i/1080p 60Hz). 24p True Cinema Technology : Yes. DVD-RW Read Compatibility : 480i/480p/720p/1080i/1080p (60Hz). Picture Parameter Adjustments : Yes (Backlight/Color/Contrast/HUE). 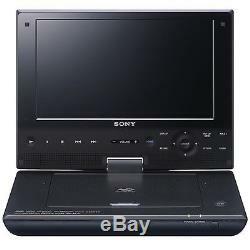 DVD-R Read Compatibility : 480i/480p/720p/1080i/1080p (60Hz). DVD+RW Read Compatibility : 480i/480p/720p/1080i/1080p (60Hz). BD-R/RE Read Compatibility : 480i/480p/720p/1080i/1080p (60Hz). NTSC/PAL (60Hz/50Hz) : Yes NTSC (60Hz). 5% GST - Alberta, Manitoba, Saskatchewan, Quebec, PEI, Nunavut, NWT, Yukon. 13% HST - New Brunswick, Newfoundland & Labrador, Ontario. 5% HST - British Columbia. 15% HST - Nova Scotia. The item "Sony BDP-SX910 Portable DVD Bluray Disc Player with Screen (9)" is in sale since Wednesday, June 22, 2016. This item is in the category "Consumer Electronics\TV, Video & Home Audio\DVD & Blu-ray Players".canada" and is located in Mississauga, Ontario.